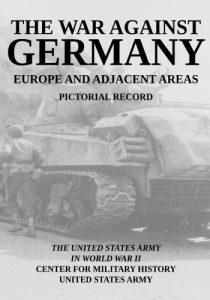 The War Against Germany: Europe and Adjacent Areas: United States Army in World War II Pictorial Record - Michigan Legal Publishing Ltd.
During World War II the photographers of the United States armed forces created on film a pictorial record of immeasurable value. Thousands of pictures are preserved in the photographic libraries of the armed services but are little seen by the public. In the narrative volumes of UNITED STATES ARMY IN WORLD WAR II, now being prepared by the Office of the Chief of Military History of the United States Army, it is possible to include only a limited number of pictures. Therefore, a subseries of pictorial volumes, of which this is one, has been planned to supplement the other volumes of the series. The photographs have been especially selected to show important terrain features, types of equipment and weapons, living and weather conditions, military operations, and matters of human interest. These volumes will preserve and make accessible for future reference some of the best pictures of World War II. An appreciation not only of the terrain upon which actions were fought, but also of its influence on the capabilities and limitations of weapons in the hands of both our troops and those of the enemy, can be gained through a careful study of the pictures herein presented. These factors are essential to a clear understanding of military history. This book deals with the European Theater of Operations, covering the period from the build-up in the United Kingdom through V-E Day. Its seven sections are arranged chronologically. The photographs were selected and the text written by Capt. Kenneth E. Hunter; the editing was done by Miss Mary Ann Bacon. The written text has been kept to a minimum. The appendixes give information as to the abbreviations used and the sources of the photographs.